like any other harness (including products called Front Clip harnesses). Place RIGHT hand over harness label on B (Back) Strap. Face your dog and place B Strap over his head and onto his back - behind his shoulder blades. The B Strap will NOT be vertical, it will angle back toward your dog's tail. The label will be on your dog’s left side. Adjust the B Strap to raise Side Rings. Place Side Rings on your dog’s sides (behind his shoulders) and higher than your dog’s breast bone. Adjust the G strap to a snug fit (like a comfortable belt). Most of the time, the Chest Strap does NOT need adjusting. 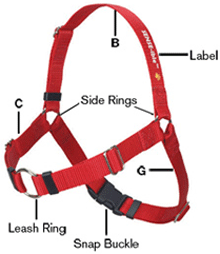 The adjusting hardware is normally next to or near the Leash Ring. 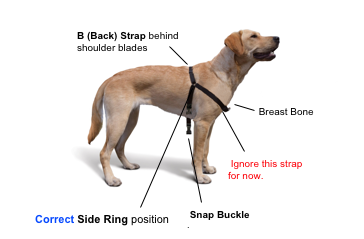 Only adjust both sides of Chest Strap if the Chest Strap does not stay up (horizontal) while your dog sits. Adjust carefully to avoid moving Side Rings over your dog’s shoulders. If the adjusting hardware is placed next to or near the Side Rings, the Chest Strap will be too short. This will cause a Wrong and Restrictive Fit and expose your dog to rubbing/chafing. 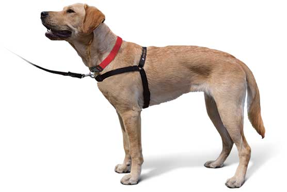 If you need to adjust the straps and your dog cannot stay sitting, adjust while he stands but adjust slightly. Then have him sit and look for the Chest Strap to stay up (horizontal). Do not check C (Chest) Strap fit with your hand unless checking it is NOT too tight. The C (Chest) Strap will seem loose compared to a restraint harness (other products). Focus on Side Ring position. 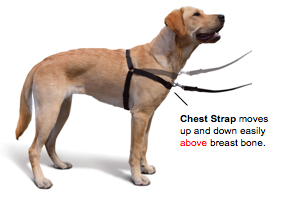 Do not adjust C (Chest) Strap snug, your dog needs room to move his legs and not feel constant pressure from the strap. If the Chest Strap is too tight, dogs will want to chew the strap for relief from constant pressure. The B (Back) Strap and G (Girth) Strap should NOT be vertical. The B (Back) Strap should be behind the shoulder blades. The G (Girth) Strap should not touch your dog's front legs. The Snap Buckle should not touch your dog's right front leg. It should rest on the right side of your dog's rib cage. 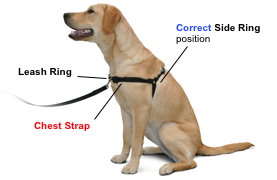 The Side Ring(s) should be behind the shoulder(s) and slightly higher than the Leash Ring. The C (Chest) Strap should angle downward over the TOP of the shoulders; from behind the shoulders to the breast bone. 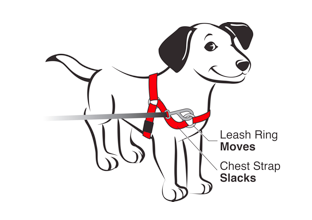 The Leash Ring should move away from your dog’s breast bone and the C (Chest) Strap should slack, flex and pivot upward when you pull your leash. This is our non-restrictive design for a unique connection with your dog’s sense of touch. Our Chest Strap and leash methods keep dogs comfortable and help them sense how to follow a leash. Clip leash to TOP of Leash Ring. Chest Strap should move up and down on Side Rings (above breast bone). While you stand in FRONT of your dog, pull leash upward and sideways. The C (Chest) Strap should slack and flex over your dog’s shoulder.